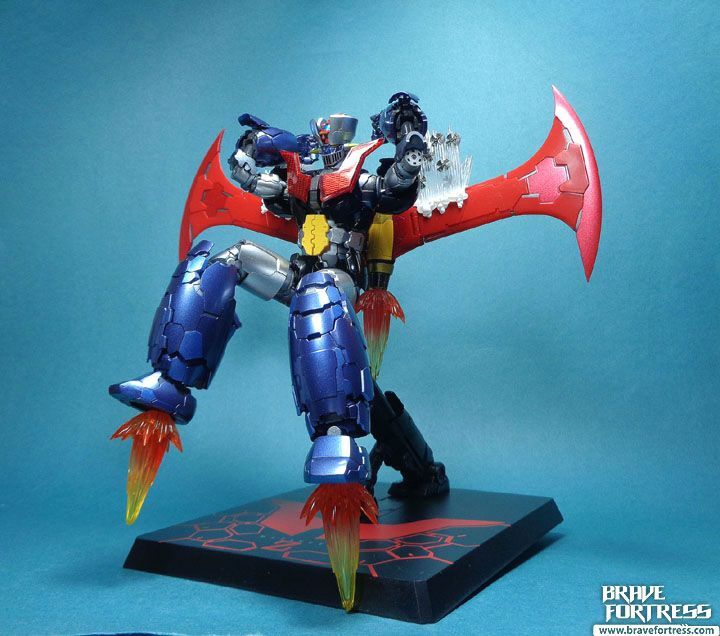 The display base is packed on the opposite side of Mazinger. Along with the rods for the effects parts display. 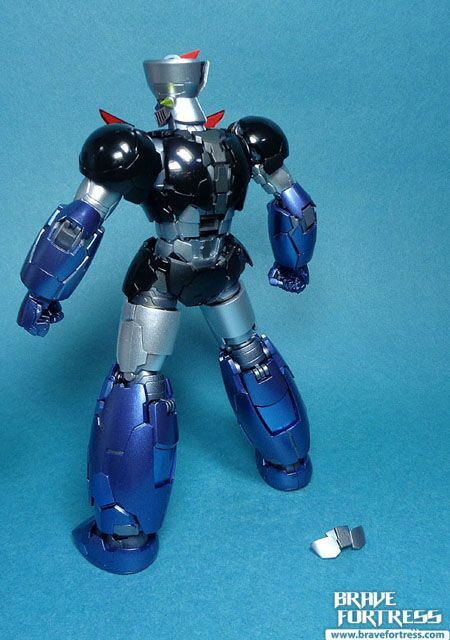 The Pileders and attachment joints are all packed in baggies with Mazinger. 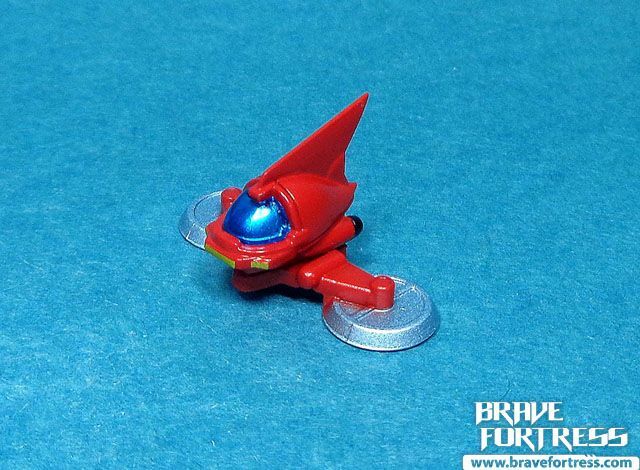 Like the usual, Bandai decided to go with swappable Pileders, I guess it’s too hard to work in hinges on wings so small. 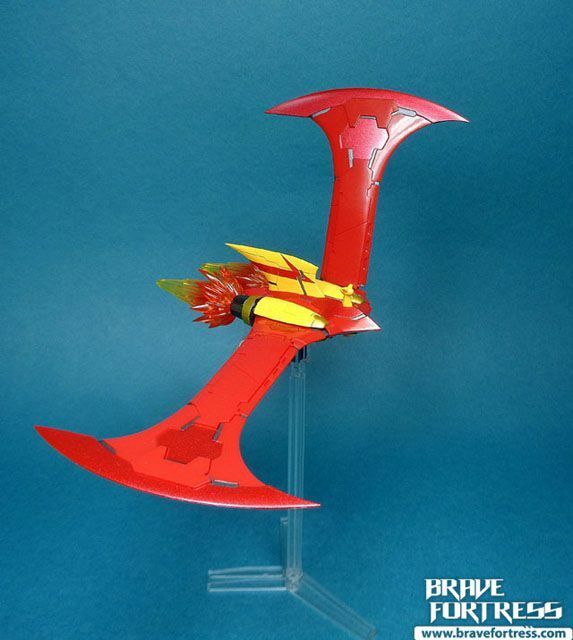 I’m really glad the makers for the Mazinger Infinity movie decided to go with the classic Hover Pileder instead of going with the Jet Pileder. 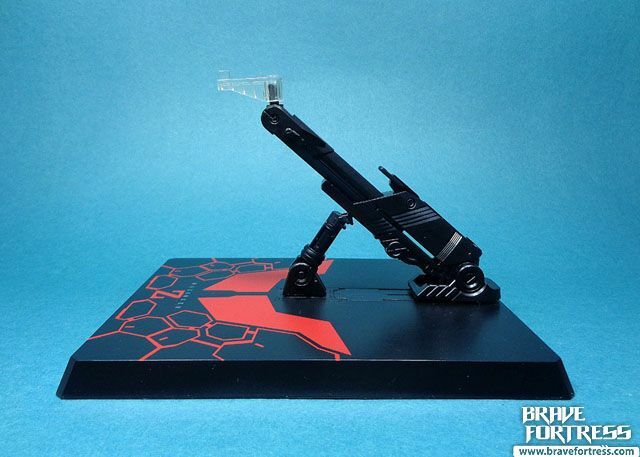 The Hover Pileder just looks way cooler. 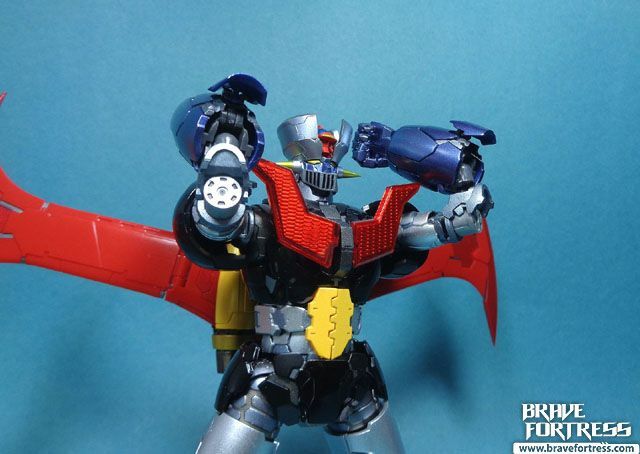 I really liked the battle scenes for Mazinger Z Infinity. 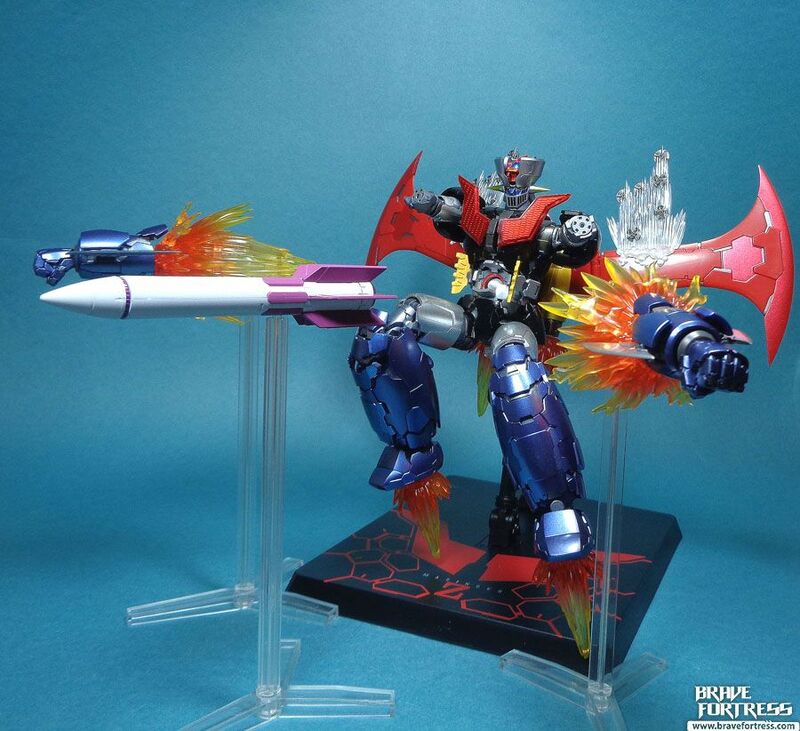 They really showed Mazinger going all out. Unfortunately, the talky bits were a something of a slow drag and sometimes it all felt a bit too cliche. 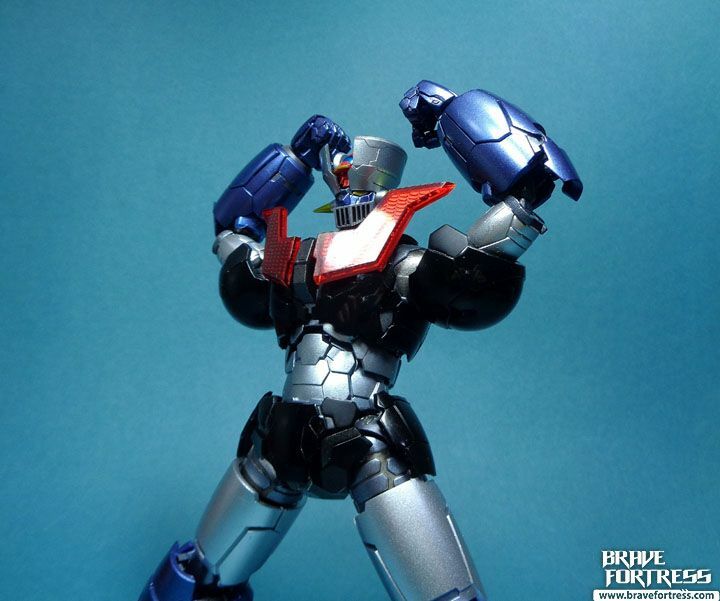 Still, compared to the older Mazinger TV episodes, this movie really got my blood pumping by the second and third acts. 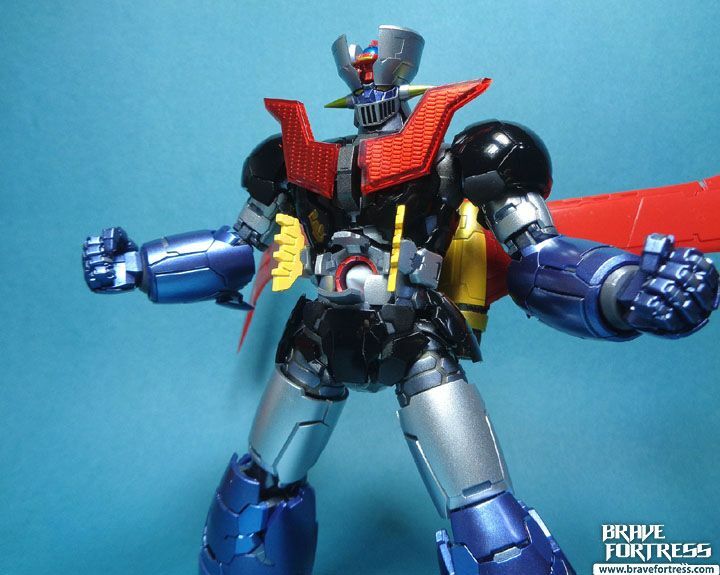 The toy is based on the new design in the movie and is meant to show a bulkier Mazinger Z compared to his classic look. 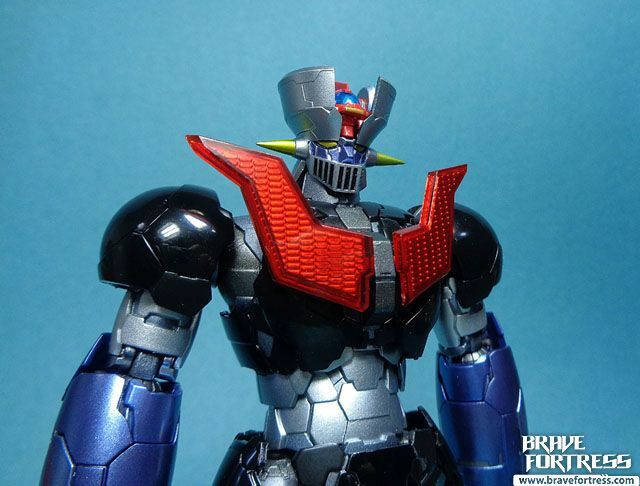 The armor panel designs work pretty well although it does make me think of Fewture Artstorm’s redesign on their Mazinger Z Gokin figure back in the day. Bandai did an incredible job with the joints system on this figure. The back of the legs collapse almost all the way in when you fold it. 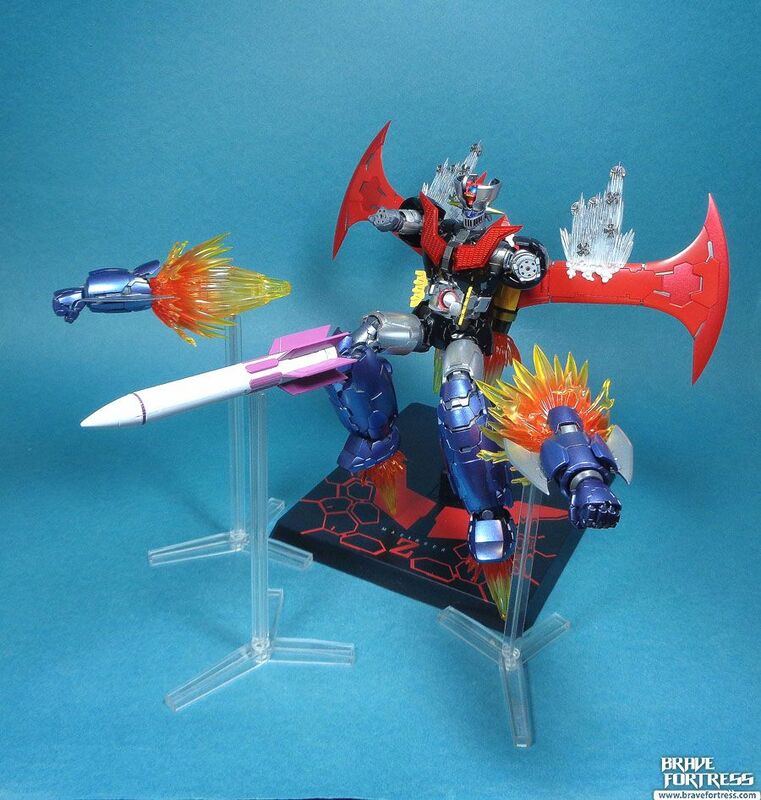 The set comes with Rocket Punch effects parts. 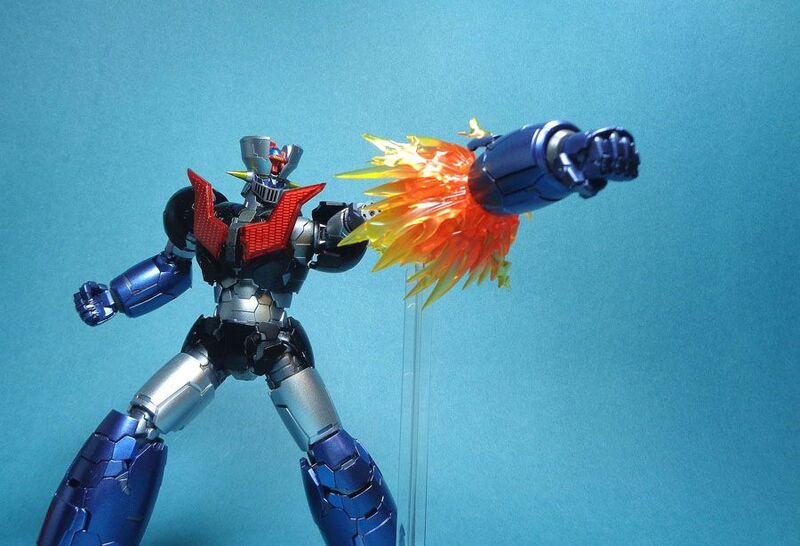 You can remove one of the ends to equip the effect on Mazinger’s arm directly. 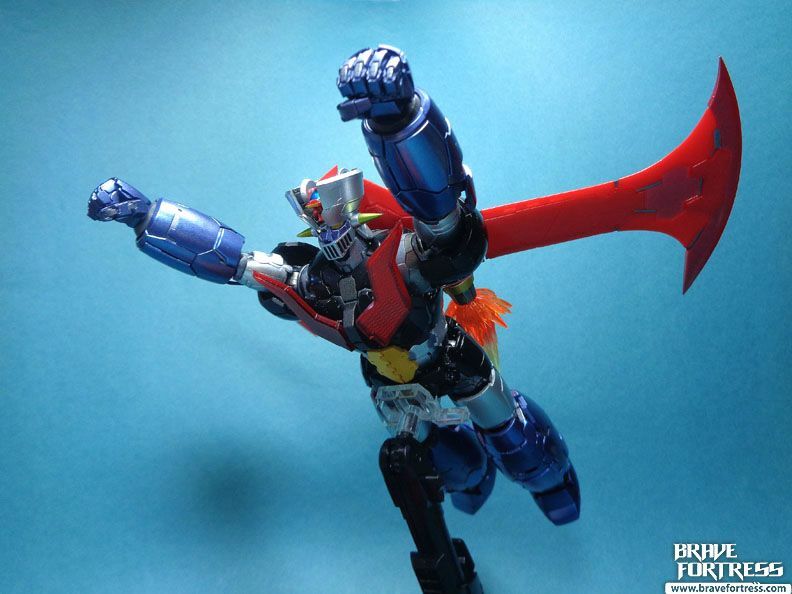 Alternately, you can peg the effect to a post to make it look like the arm is flying. 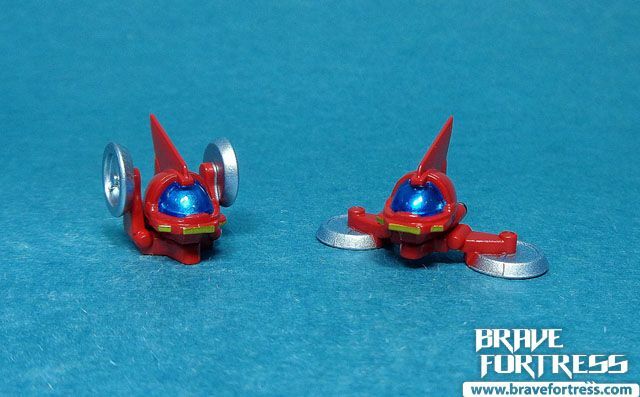 Included with this set are 2 different attachments for his elbow, one is for when you launch the Rocket Punch Attack (otherwise it will leave the diecast elbow peg exposed) and the other is for when he folds up his arms for the Drill Missiles attack. Jet Scrander. 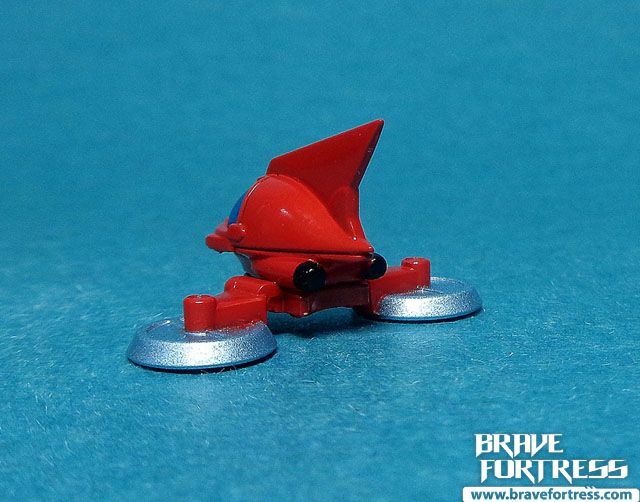 The Jet Scrander comes with optional thruster effects parts as well. 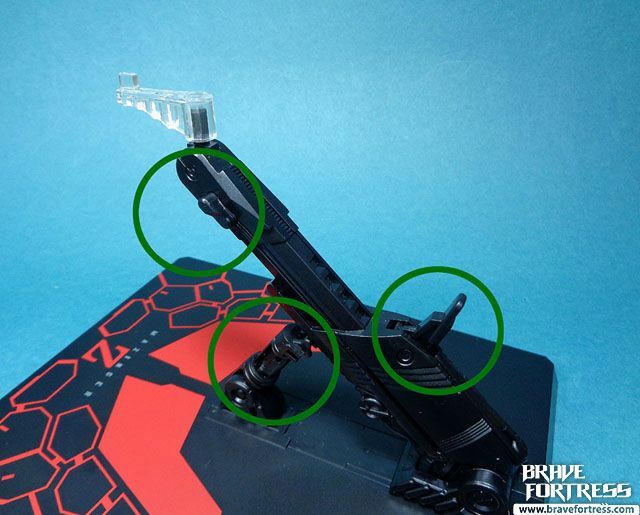 By using one of the clear attachment blocks, you can peg the Scrander to the clear posts as well. 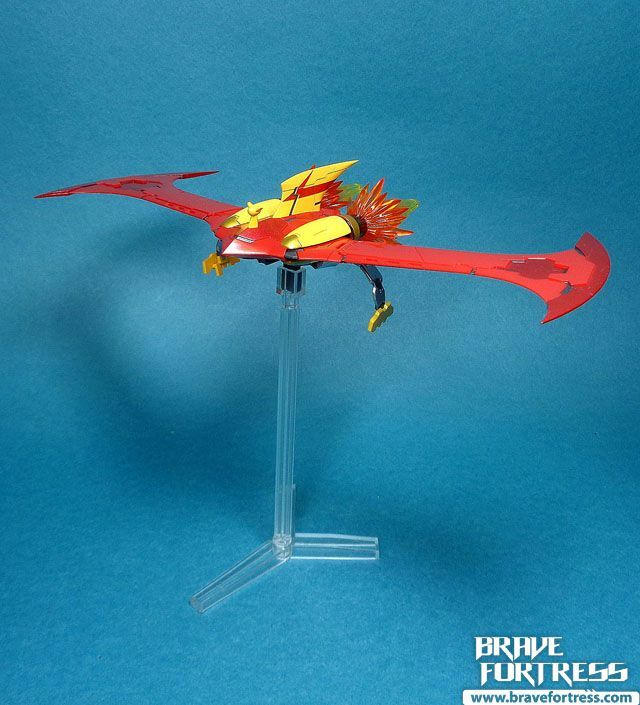 The Jet Scrander actually is very impressive, it has adjustable wings and can even fold it’s wings thanks to a hinge. 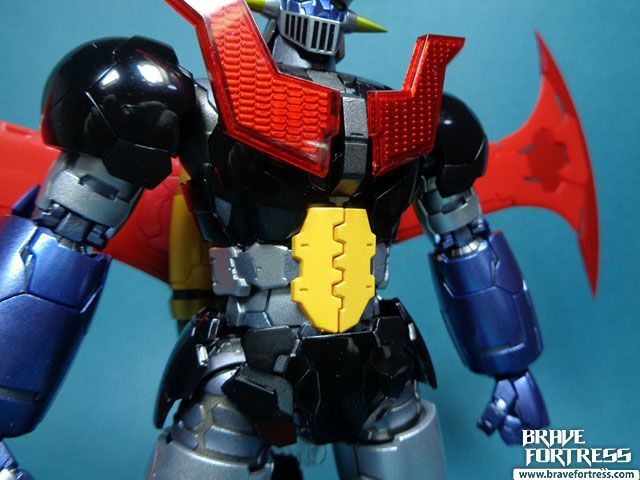 It also sports some diecast (the thruster nozzles) and even has a ratchet joint, something the MB Mazinger actually doesn’t have on his body. 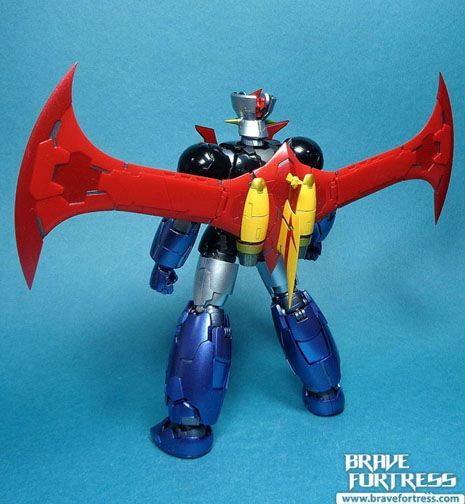 To attach the Jet Scrander you have to first remove this panel from Mazinger’s back. I’m not too crazy about how the yellow section looks, it makes me think of soda crackers actually. But it is impressive how the chest has moving plates so that it can move upwards to accommodate the Scrander’s buckle properly, this little bit of engineering really impressed me. 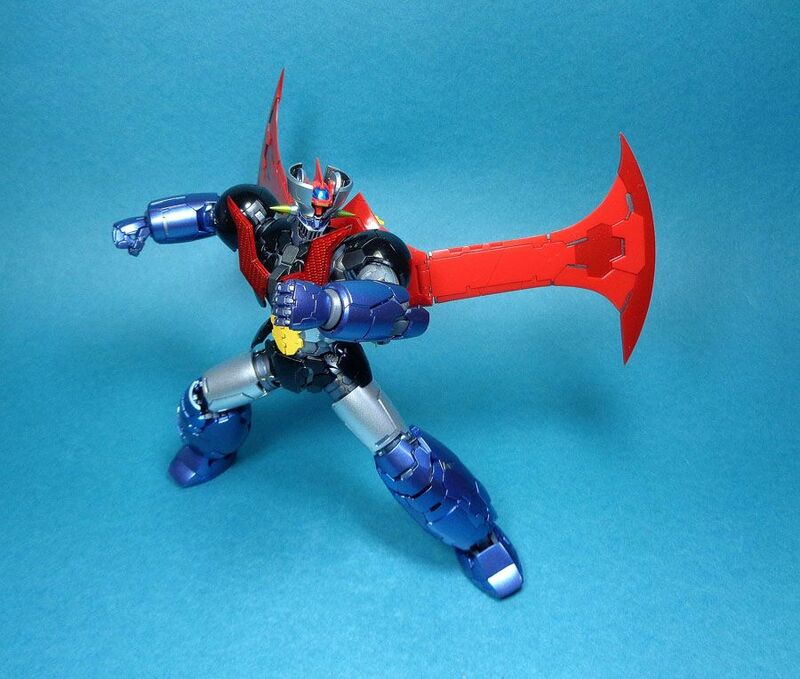 I really love how poseable this figure is, even with the Scrander equipped, he’s still very poseable and looks great! 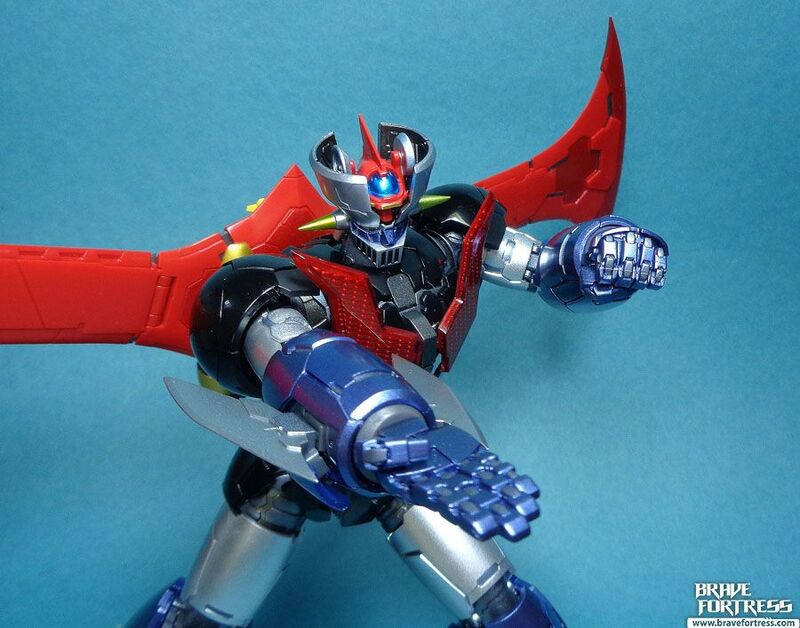 In the Infinity movie, Mazinger’s Iron Cutters were mostly used as a melee weapon on his forearms. 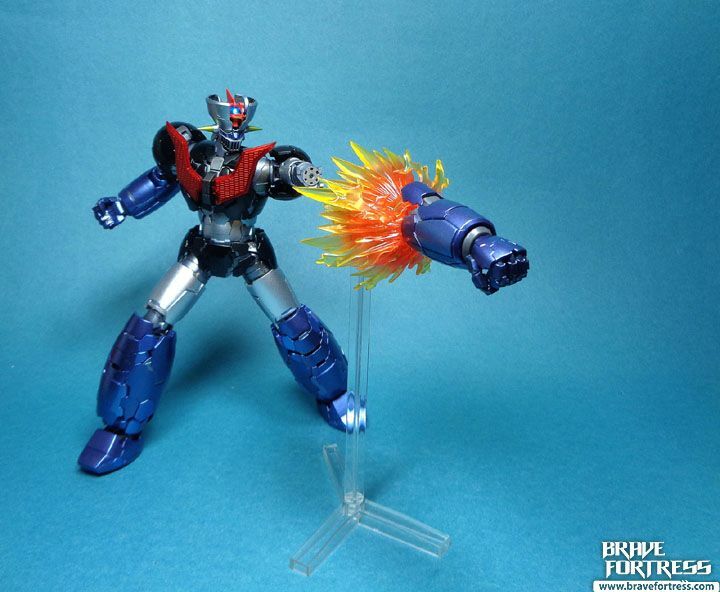 I guess this is to give way to the Rocket Punch as the more preferred “firing” arm projectile (coz it’s what fans want to hear). 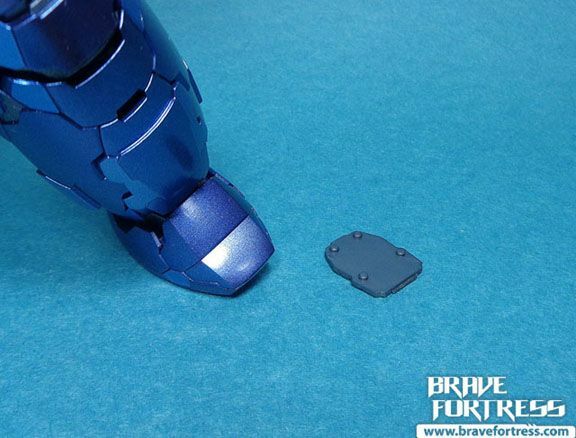 Attaching the Iron Cutters require removing the diecast portions of the forearms and replacing them with the Iron Cutter plates. Easily the hardest part of this toy. Swapping the abdomen parts around is a serious pain in the neck!! I won’t be doing this again. They really could’ve simplified this. 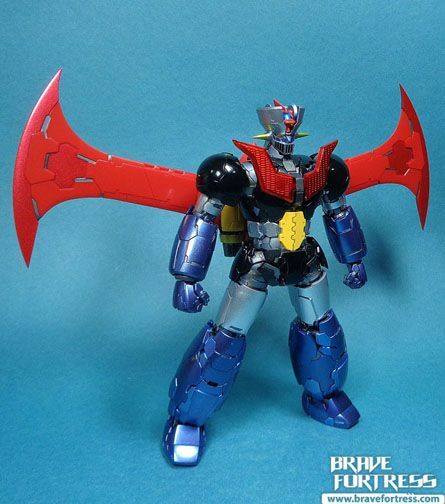 I don’t know, maybe it’s just me but I had a hard time getting the parts off of Mazinger. 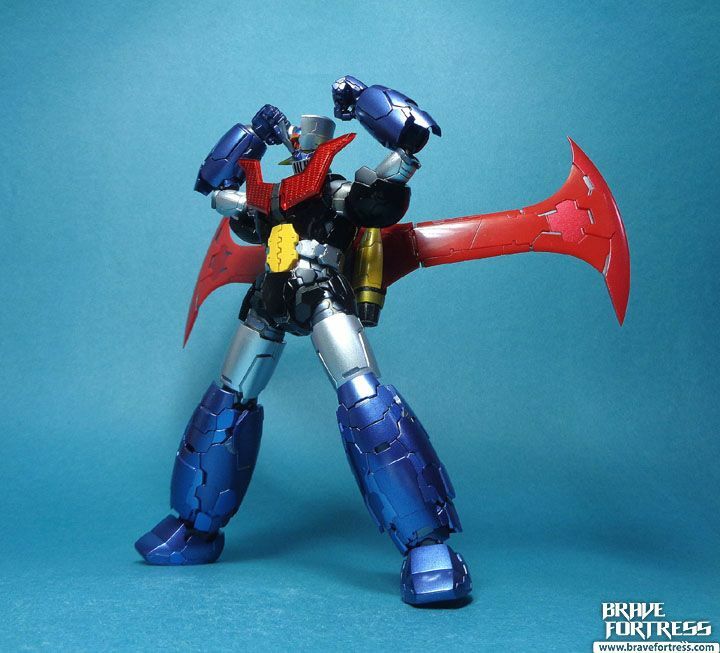 Bandai included an optional Jet Scrander buckle so that Mazinger can still use the Missile Punch now, even with the Scrander equipped. 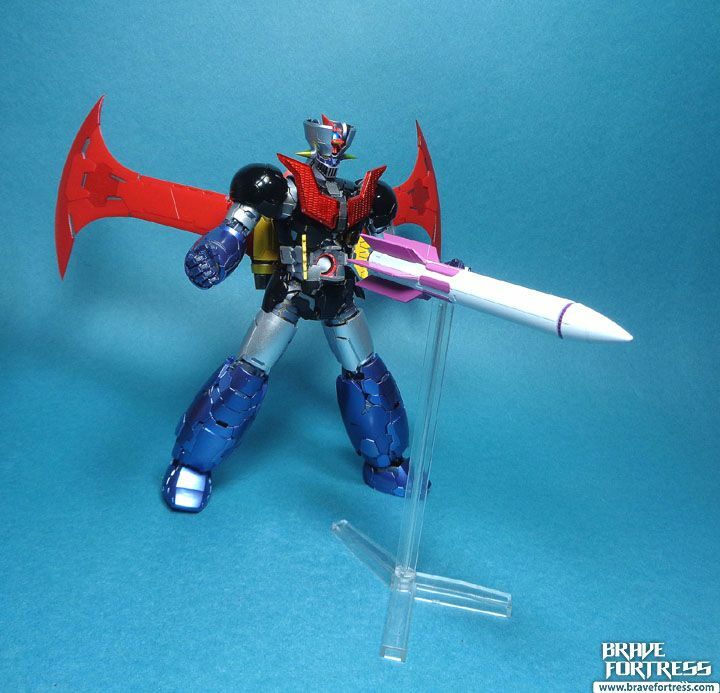 Note that one of the posts is shorter than the other three, this is the one for the Missile Punch, otherwise it will look odd that the missile is higher than Mazinger’s belly. …. 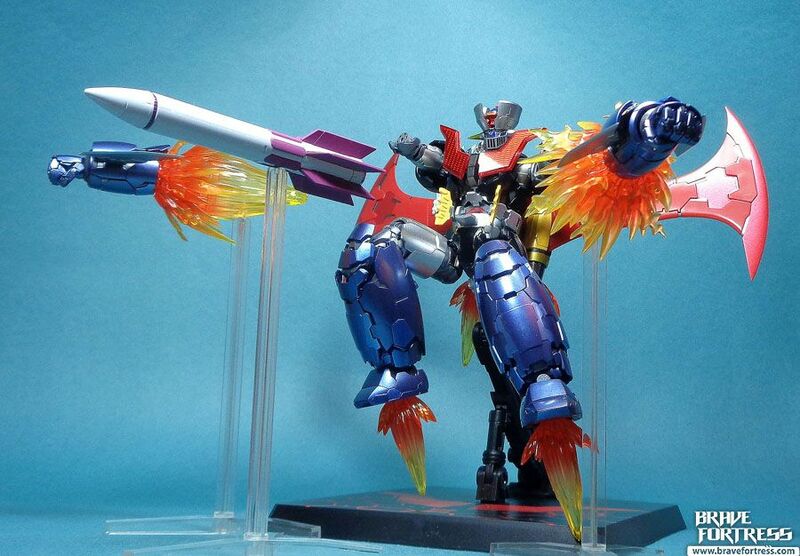 Yeah, I can’t believe Mazinger’s packing multiple missiles longer than his legs inside his belly too. This seemed like a real of stretch for the imagination…. 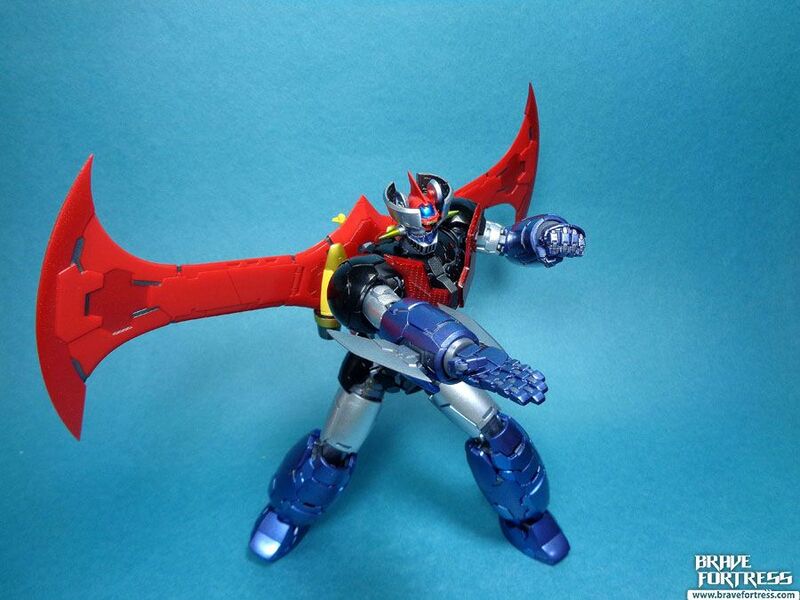 Southern Cross Knives (sure wish these parts were available for the DX Mazinger Z). 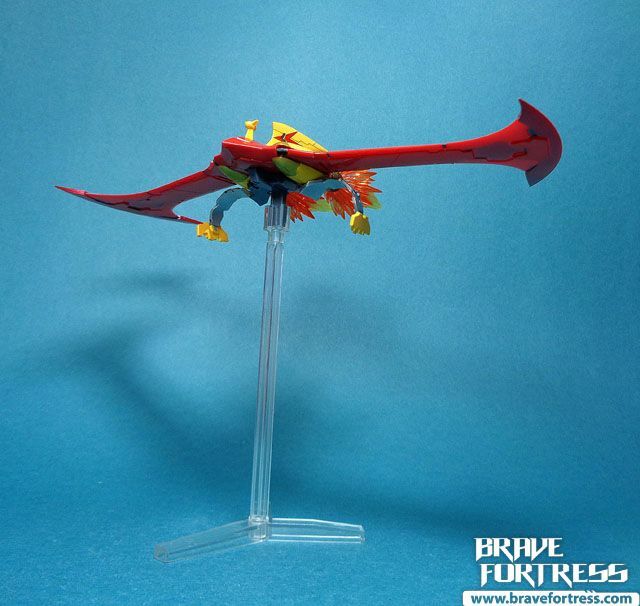 A word to the wise, the Southern Cross Knives parts don’t really lock onto the wings. They just sort of sit there. There’s a little notch to make sure they slot in right but it won’t lock them in place. 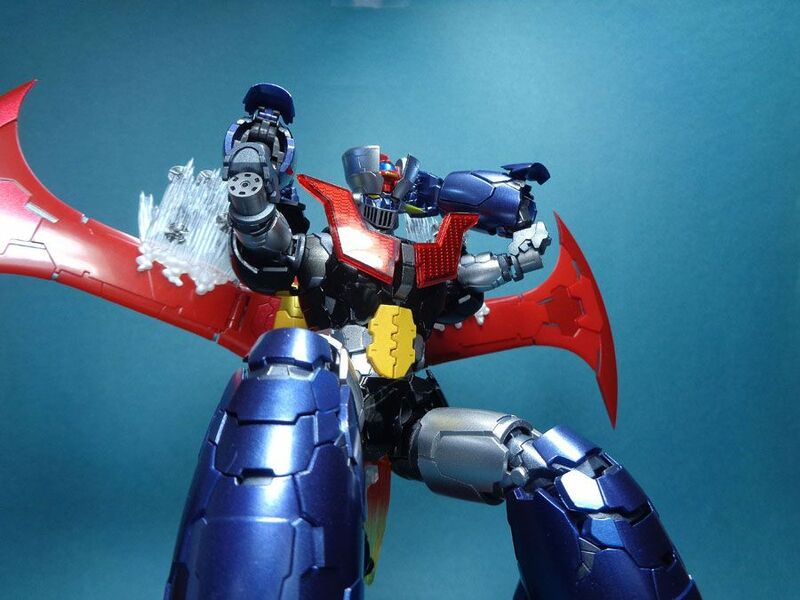 You can flick the effects parts right off using one finger. They look super cool though. 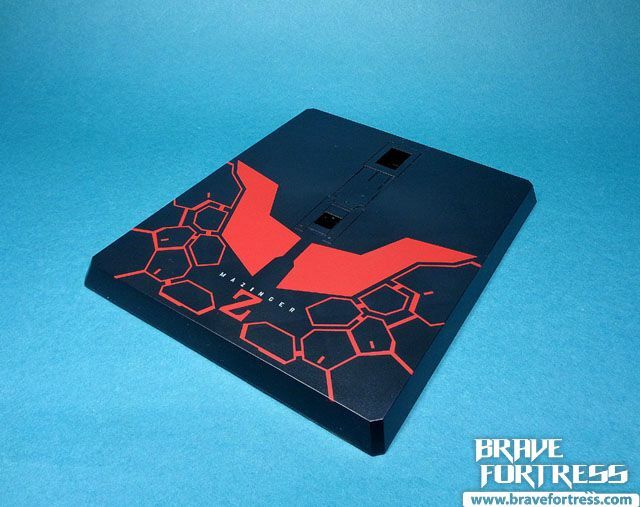 I like the etching on the base a lot! 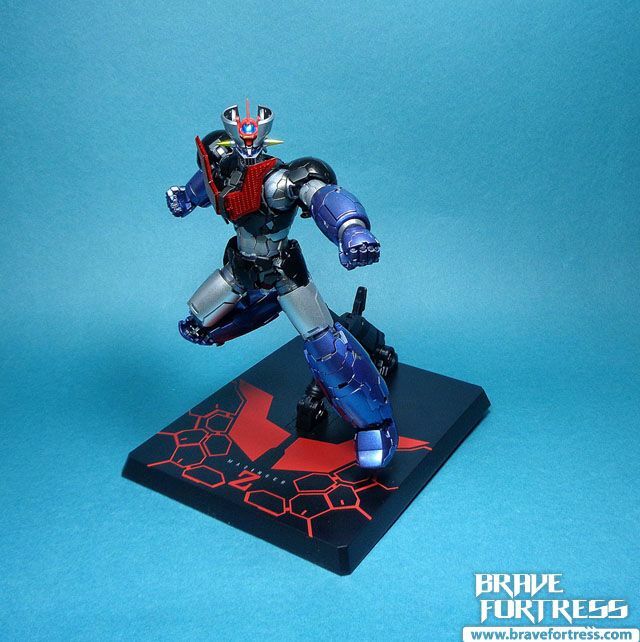 Way better than the usual run of the mill SOC base. 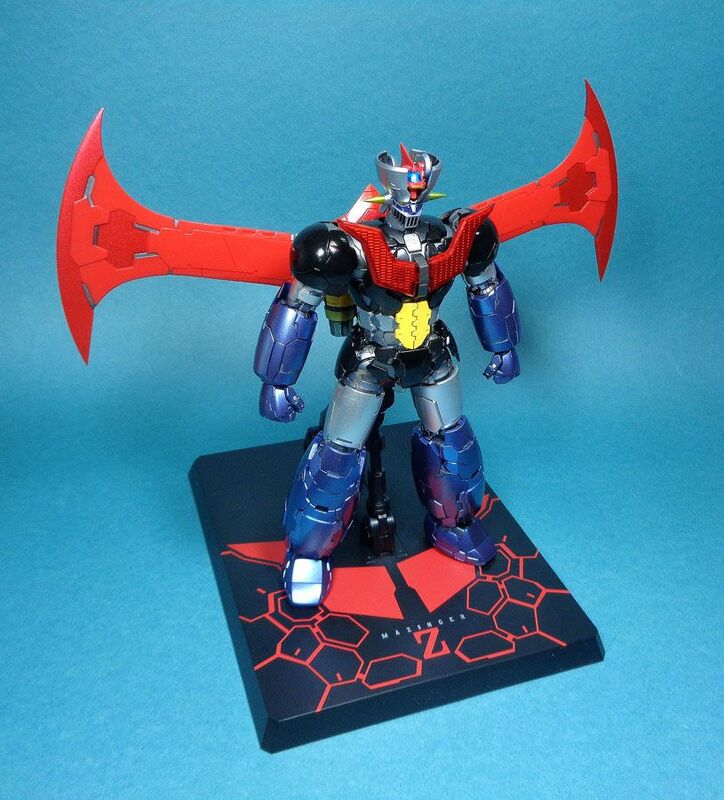 The display base comes with an arm attachment for holding Mazinger Z in place. The arm is very adjustable thanks to the many various options. There are three locks that are utilized in the arm, it’s pretty amazing that they went and did all this. 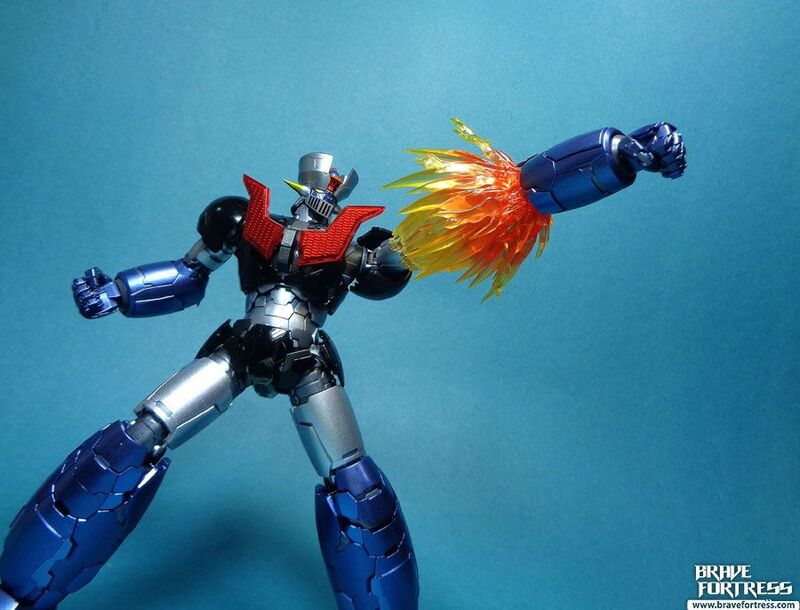 It certainly blows away the corny display stand arms on the SOC DC Mazinger Z and friends. 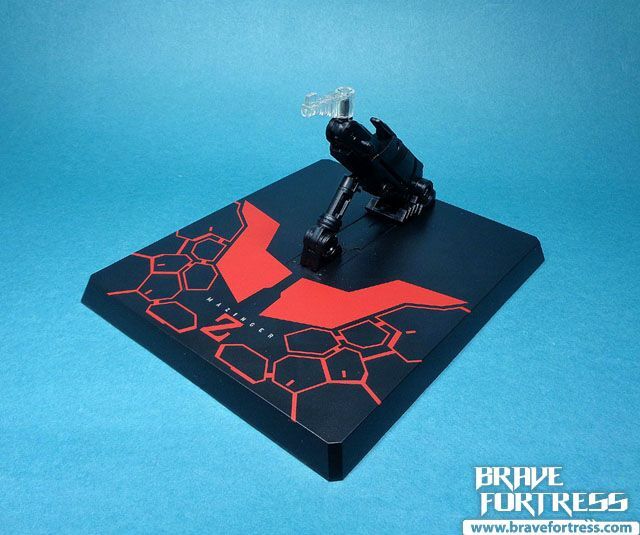 I’m not really familiar with the Metal Build line, do all their releases come with these types of detailed display stands? 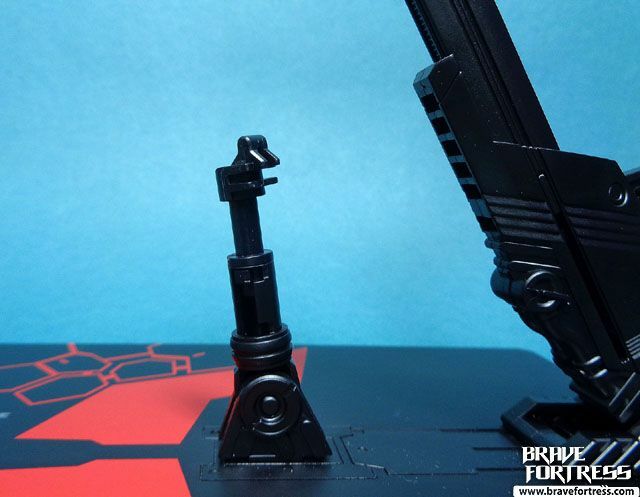 This little support arm also has it’s own adjustable height, by twisting the tip of the arm to unlock it, raising the arm and twisting it back in to lock, it’s ingenious! 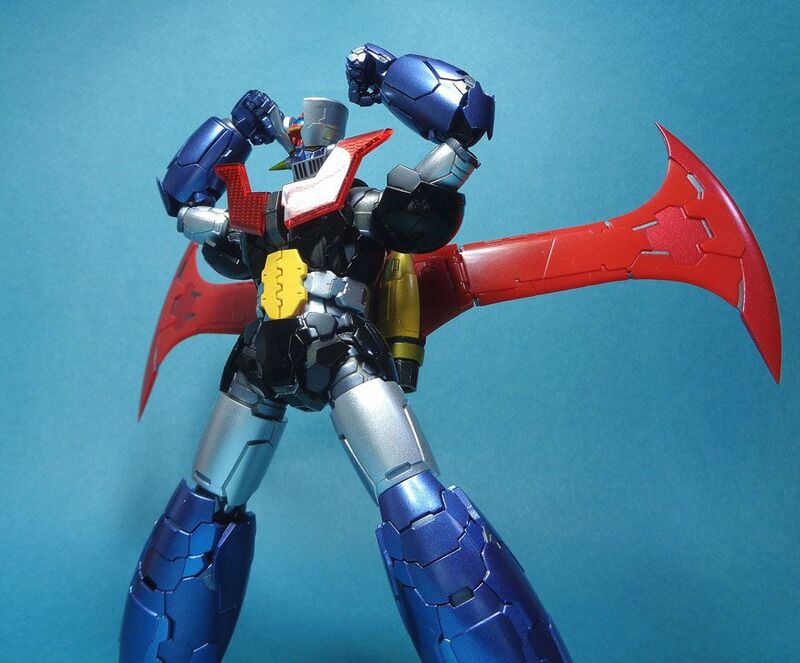 The little support arm plays a big role in getting Mazinger Z to pose right in flight mode. Otherwise, it will make him look awkward. I was having a hard time making him look good in flight mode until I discovered the adjustable neck on the little support arm. 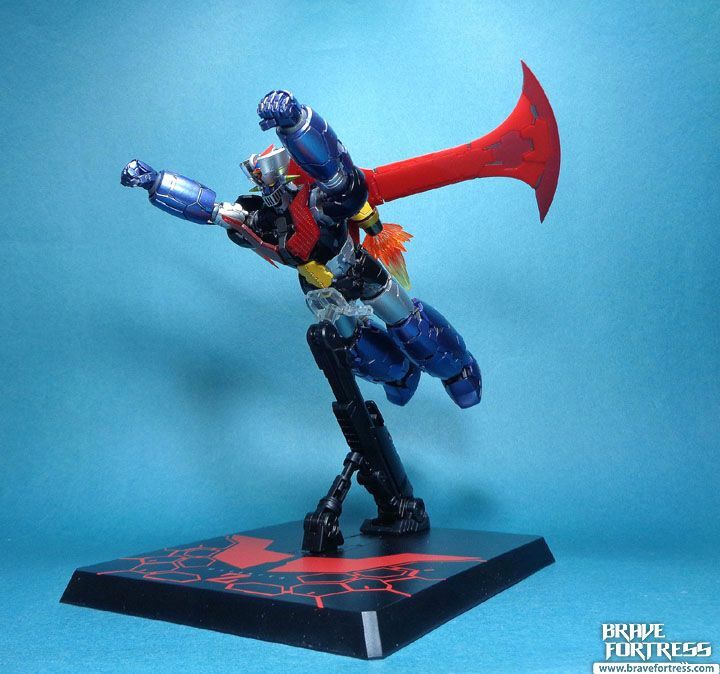 The display base is a big help in getting Mazinger to do his all out attack pose. 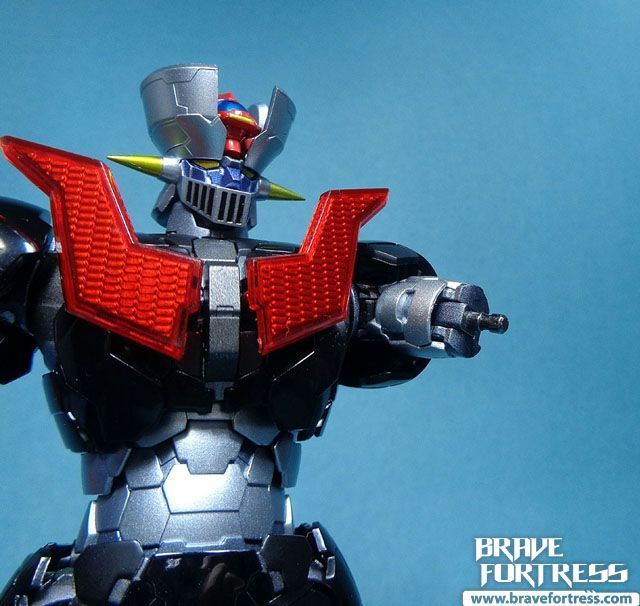 Lastly, the display base holds Mazinger Z firmly in place, and looks really good doing it to boot! Like I said, that etching goes a long way. 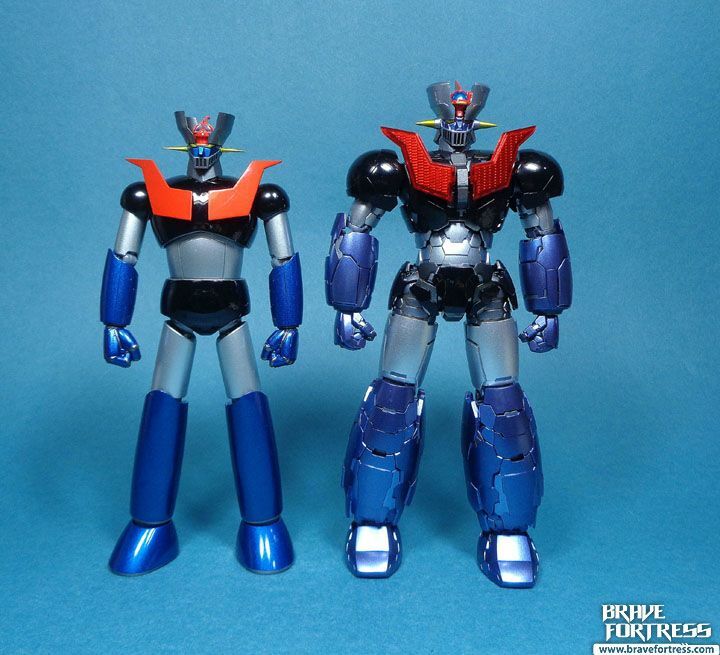 Comparison with the Gx-70 Mazinger Z. 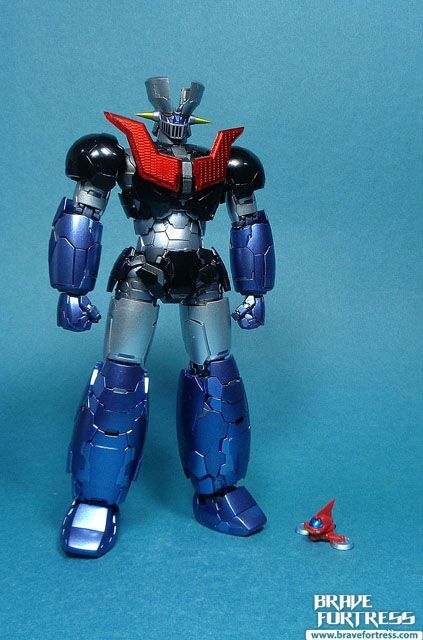 The Metal Build Mazinger is a bit taller. 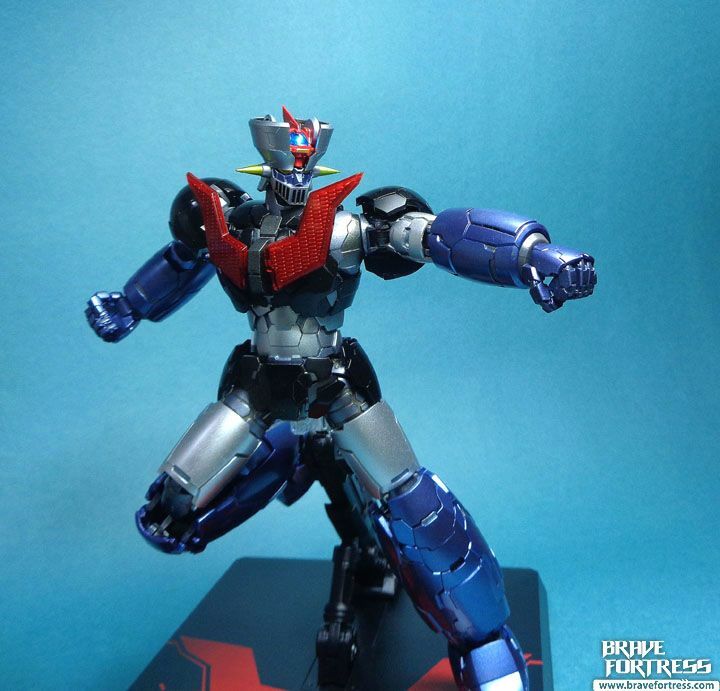 -Metal Build Mazinger weighs 290 Grams (327 with Scrander) and stands roughly 7.25 inches tall. 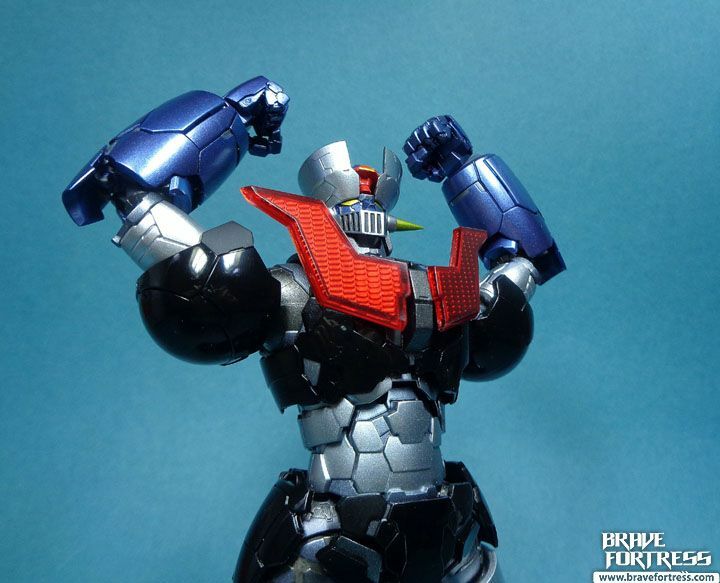 It is heavier than the Gx-70 D.C. Mazinger Z (259 Grams without Scrander), but the Gx-01R is heaviest (320 Grams without Scrander). 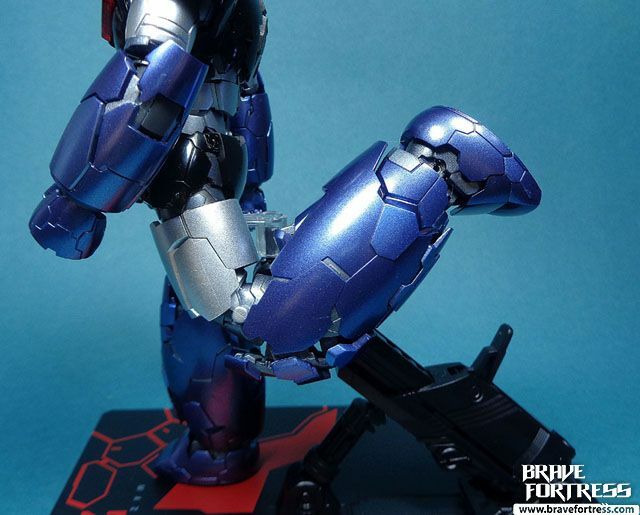 -Impressive articulation. You can literally recreate all the poses from the movie. 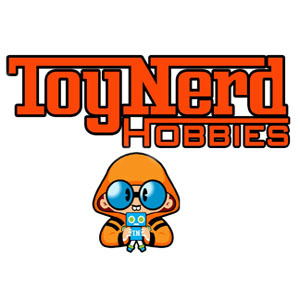 -Lots of effects parts and accessories! 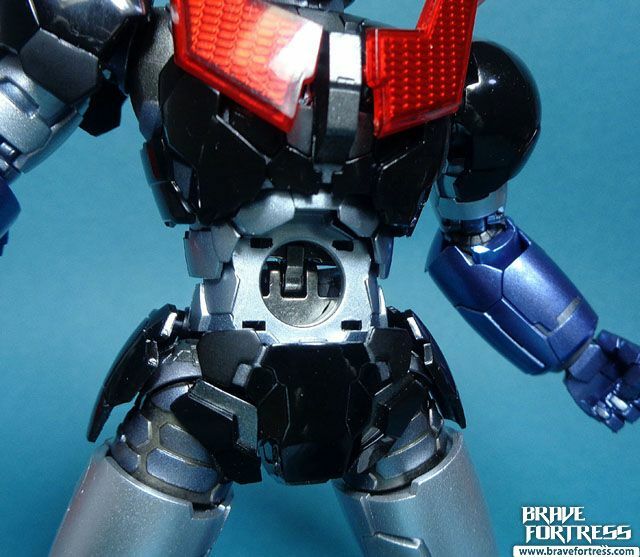 -Gorgeous details and moving chest and skirt plates. Very well done engineering. 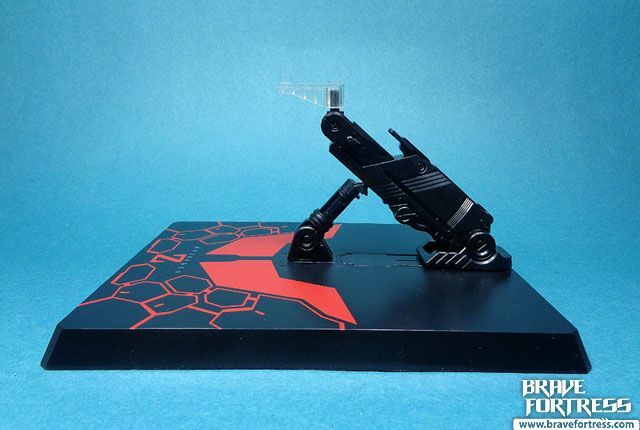 -Display stand rocks! 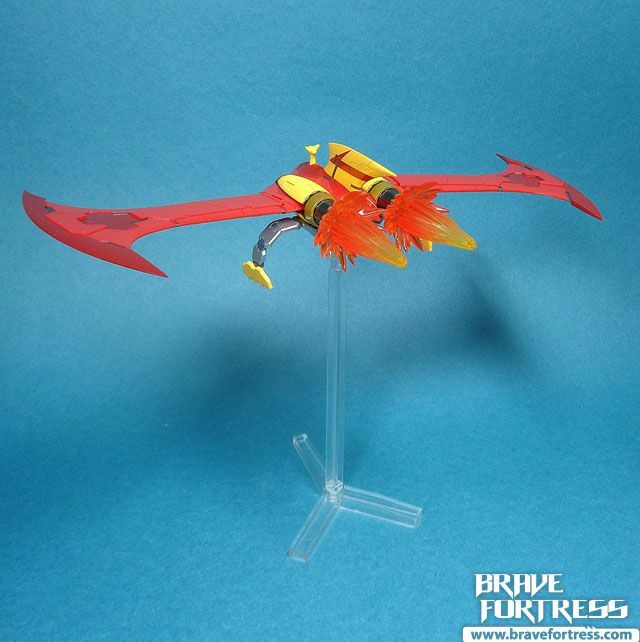 Again, well planned engineering went into this and it shows, the display base is the unsung hero of this set. 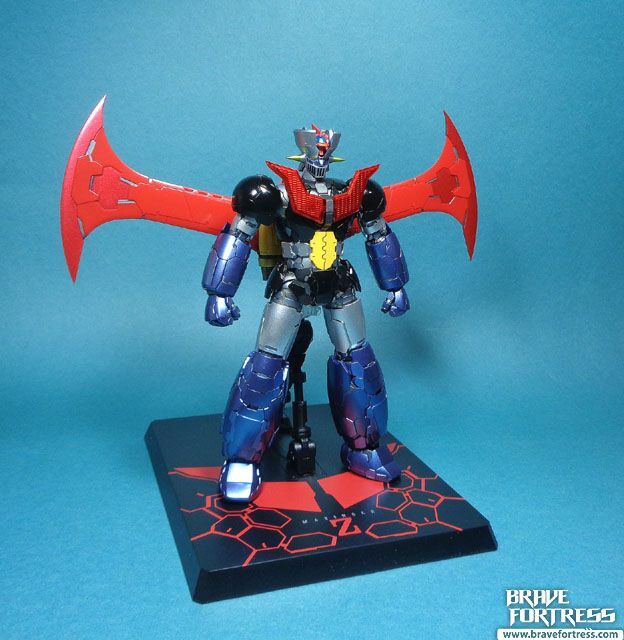 -Zero ratchet joints on Mazinger (the Scrander’s wings has ratchets though). -Removable plantar plates. 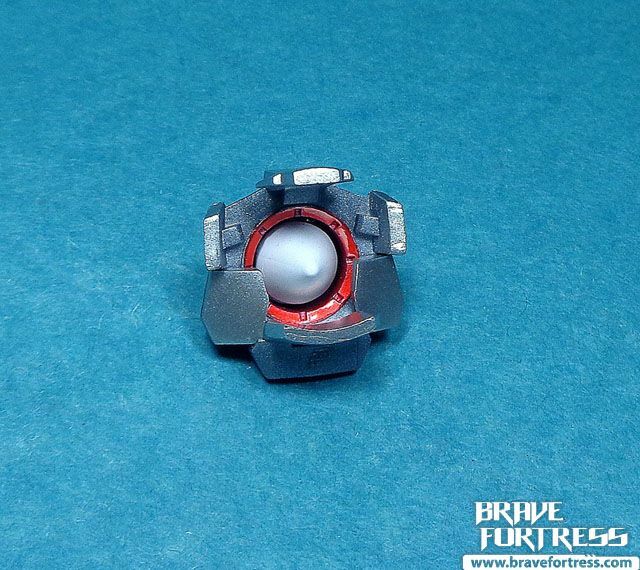 I wish they came up with an alternative here for attaching the booster thrusts effects. These plates come off a bit too easily for my tastes. 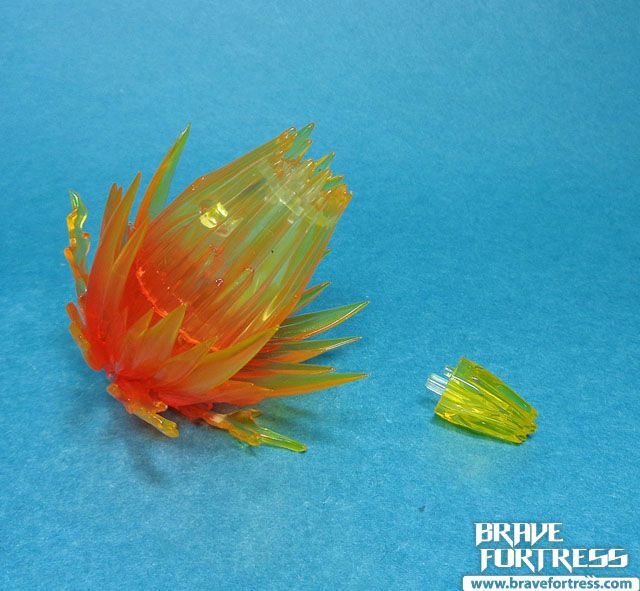 Better to just remove them and leave them in the tray than lose them if you ever plan to display this toy. Be warned! -Ridiculously difficult to remove abdomen parts when swapping in the Missile Punch option parts. -Pileder is connected via peg and hole. 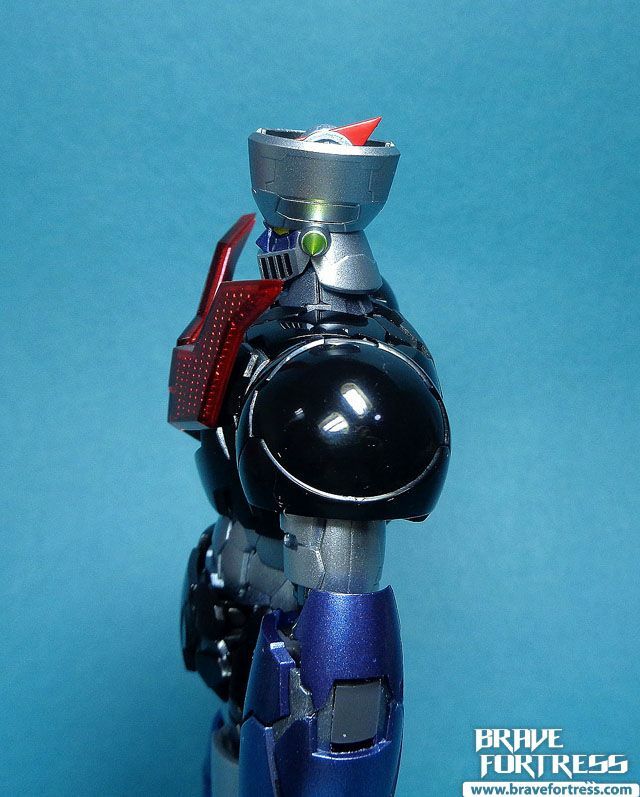 I miss how they did the Gx-70 magnetic Pileder design here. It feels like a step back now. 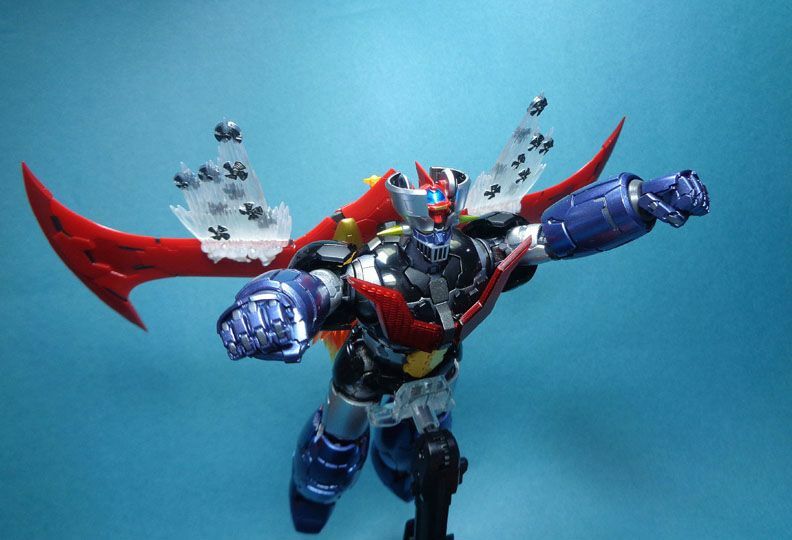 -Plastic “armor” covering the diecast parts didn’t really work for me. The lack of the cold, metal “feel” that we’re used to from years of handling SOCs just isn’t here. 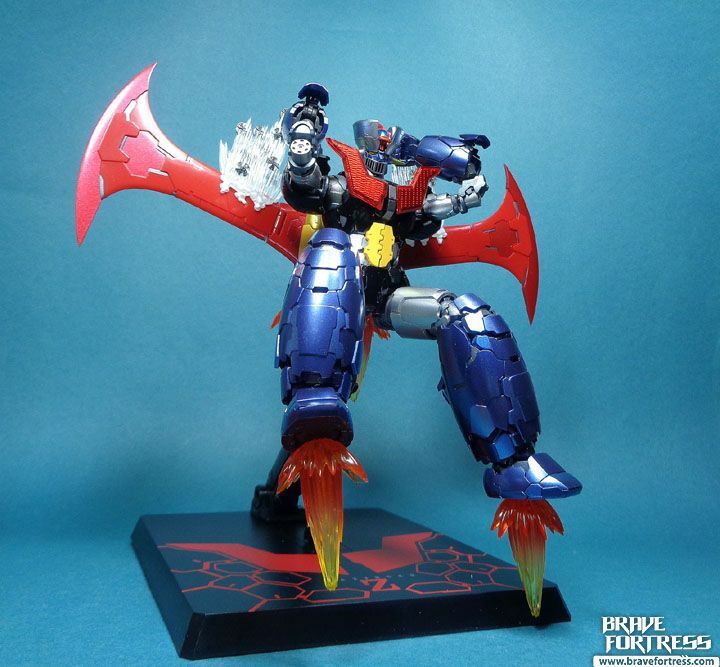 Neo Chogokin? To be fair, it is not an official SOC release though. 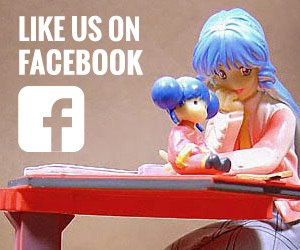 No real qualms about the quality of the figure, it’s really top-notch! I did, however, find my expectations of the toy knocked down when I opened the actual contents. 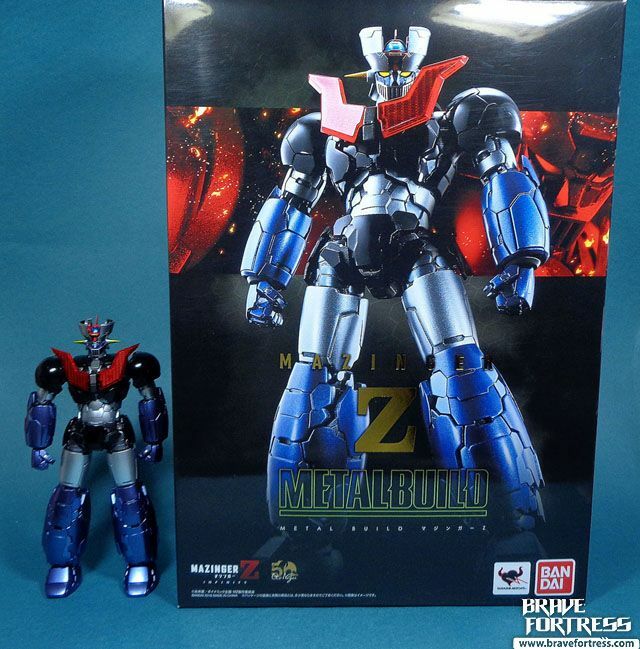 The box art shows such a big Mazinger Z, that when you get to the actual toy all the way at the bottom of the inside of the box, it looks underwhelming. 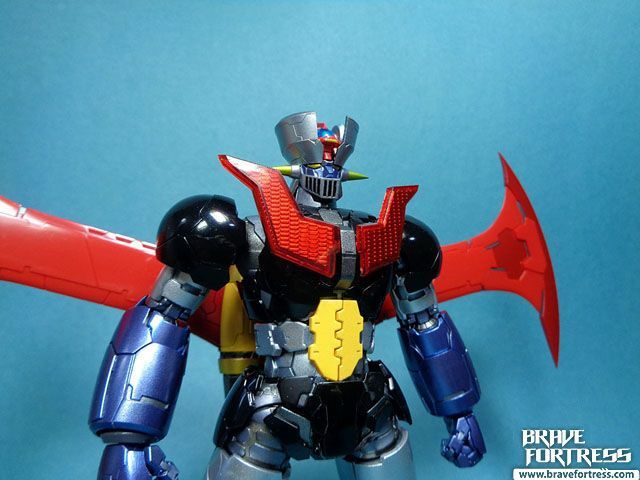 What makes it worse is that when you do open the styro tray containing Mazinger, you realize the toy’s even much smaller since he shares space with the Pileder and accessories. My 8-year old daughter literally went “what the?” when she saw it (she was next to me during the unboxing). 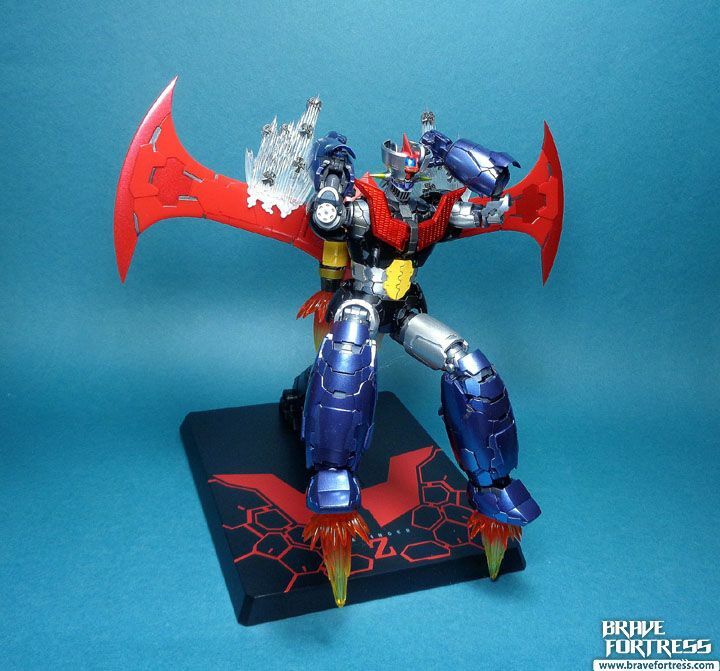 Yeah… somehow I think Bandai should really re-examine how their new box layouts should go. Overall, it’s an amazing piece, I love it a lot! The poseability is incredible, the engineering and design are over the top and it looks great too! 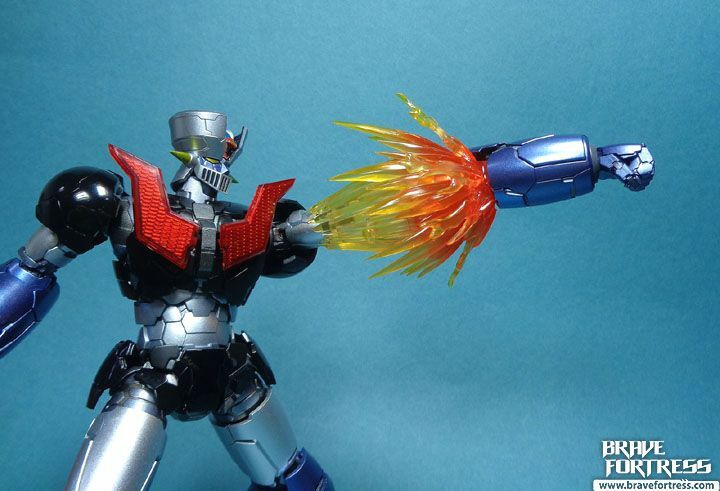 This is hands down my favorite Mazinger Z toy to date, it’s just so much fun to handle! 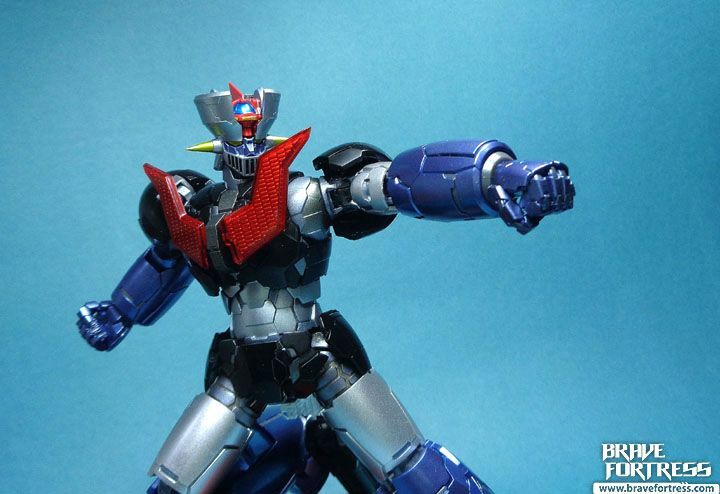 I keep hoping Bandai will release Great Mazinger too but I guess it’s probably a long shot.